This is sooo cool! My Handspring Visor Prism was getting pretty beat up, been dropped one or two times too often, and how held together in a couple of places by tape. The screen was sometimes reluctant to accept input. Time for an upgrade! At the moment, the Clié is the state-of-the-art in PDAs. It's got a high resolution color screen half again the size of the Handspring, and with twice the resolution. Also includes a voice recorder, 2 megapixel camera with flash, MPEG movie recorder and MP3 player. It accepts both Sony's Memory Stick and Compact Flash cards. Unfortunately, it can't access both at the same time. If I had realized this, I wouldn't have bought the 256 mb Memory Stick, since I later got a 512 mb Compact Flash card for less money. Actually, though, the Memory Stick is useful, because I also got a WiFi card that fits in the Compact Flash slot, so it's good to have the MS for storage when I'm using the Web browser. (It connects to my AirPort.) I have the NetFront Web browser, which is pretty amazing for such a small device. It is also theoretically capable of handling email, but my emiail volume is too high to make this practical. At some later date I may set this up with a separate email address, but I really don't have a great need for that feature. Books. I have come to greatly prefer reading books on the PDA to old fashioned paper books. The type is much easier to read, whatever the ambient light may be. Unlike a book, it can be operated with one hand. Because the screen is small, when you put it down and then get back to it, you don't have to hunt over a two-page spread to find your place. I was never comfortable reading paper books in bed. If the light was right for left side pages, it was wrong for left side pages, and it is extremely awkward to read while lying on your side. The PDA gets around all of this. Organizer. The "organizer" functionalities are really useful. I've got my whole address book and appointment calendar right at hand all of the time. With my previous Palm and Handspring units, I wasn't able to get any use from their alarm functions because they weren't loud enough, but the Clié has an actual speaker, and I can easily set alarms to remind me of whatever I need reminding of. I also use it to keep track of my checking and credit card accounts, and shopping lists. Photo album. I have loaded up lots of my favorite photos, my family, friends, bicycles and scenic shots I've taken over the years. The Clié has a really bright 480 x 320 pixel color screen, shows them off to excellent advantage. Voice recorder. 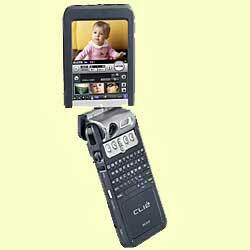 The Clié will record many hours of speech with surprising fidelity. I use it for learning new music at rehearsals, and various other applications. It doesn't work too well for loud music, though, because it tends to overload. MP3 player. Holds a couple of hours of music. Camera. 2 megapixel camera built in, but I rarely use this because I generally carry my Nikon 2500 in my other pocket, and that's a rather better camera. Video. The Clié will record little MPEG videos with sound. Haven't used this feature too much, the images are pretty small. Reference. French/English dictionary, tide table, various other things. Games. Got lots of those! Remote control. Universal remote for all my hard-wired audio and video stuff. Web browsing. With plug-in WiFi card, I can surf the net using various access points. Sony's bult-in software doesn't support Compact Flash cards, but this add-on does. This is a utility that lets the Clié run applications from the storage card, freeing up main memory, which is rather scanty on this model.